The Marabana Havana 10K, half and full marathon is a bucket list race that allows runners to explore Havana alongside our Cuban running friends. As the foremost provider of legal people-to-people travel to Cuba since 2000 and under a general license from the U.S. Department of the Treasury, we are offering Americans the rare opportunity to participate in the 2017 Marabana Havana Marathon NOW $600 OFF per couple! Join us to become part of marathon history. 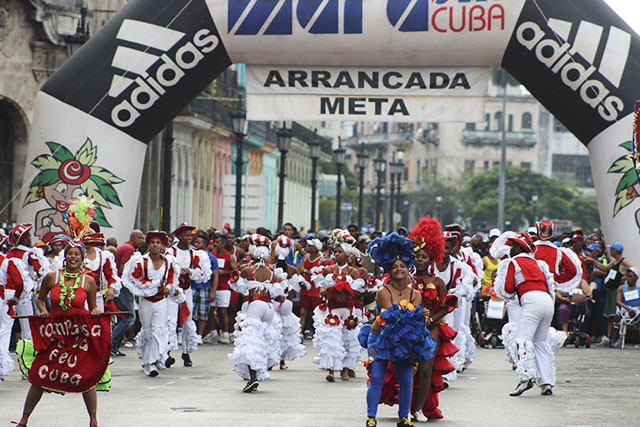 In addition to the Marabana Havana 10K Half and Full Marathon, Havana hosts one of the most festive shake out runs in the world called the MaraCuba. This run takes place the day before the Marathon and is a fun 2K race that is hosted across the country in celebration of health and fitness. It begins with salsa dancing at the start line and runs through the streets of Old Havana giving you a preview of the course. You'll have a chance to run/walk alongside participants of all ages and make friendships that will last a lifetime. People-to-people travel has a way of bridging the gap and connecting our souls, and the running community is tight knit and welcoming. Participating in the Havana Marathon, will give you the chance to meet people from all over the world and form lasting bonds. Old Havana, a UNESCO Heritage site known for its Spanish colonial architecture is every photographer/instagrammer's dream, so bring your camera to capture the magic. Not only will you have time to explore the city on your own before and after the race, the course winds through some of the cities most iconic neighborhoods and monuments. Talk about bragging rights! Cuba is home to American cars from the 1930s, ‘40s, ‘50s and ‘60s, all in mint condition. Flag one down and go on a joy ride back in time. Run by the city’s many monuments and sites, including the Capitol, Revolution Square and the Fortaleza de San Carlos de la Cabaña, the famous fort at the mouth of Havana’s harbor. Breathe the ocean air and take in the scenery as you experience the cities iconic seaside Malecón. There is no better way to recover from a race than to try a little Cuban salsa dancing. To many Cubans, this dance comes as easily as walking. But don’t be deterred, there are many dance studios where you can take a lesson, or for a crash course, check out one of the many clubs such as 1830 and ask a local for tips! Trust us, you’ll have a blast. Travel will always expose you to new things and teach you about different ways of life. And for many people, running a marathon may seem like a huge undertaking, which is why you should go for it! Each time you step out of your comfort zone and accomplish something new, you will grow, become stronger and build confidence. You’ll feel the rhythm of the nation as soon as you hit the streets of Havana. The world-famous music scene is one of Cuba’s greatest draws. Whether you see a show at the Tropicana Club, a world-known cabaret or simply catch musicians performing on the street, you will not be disappointed. There are countless famous dining spots and watering holes for you and your new friends to check out. Celebrate your race with dinner at La Floridita, one of Hemingway’s favorite spots for drinking daiquiris, and enjoy a mojito and a cigar at the famous oceanfront Hotel Nacional. Running the Marabana Havana 10K Half and Full Marathon is a new opportunity for American runners. As you toe the line, you’re creating a new movement together; a movement that will set the pace for future Americans to put the past aside and create new memories. If you’re a distance runner, and have always wanted to visit Cuba, we invite you to join us for a momentous journey to Cuba to make running history. Register for the 2017 Havana Marathon today!